Been a little under the weather for the last week or two, so not much knitting or sewing done. So after a little sort out of the sewing room, trying to find projects to kick start my Mojo. The sock stock is well on target for twelve pairs this year, April's has already been gifted so I am one pair short in this photo. 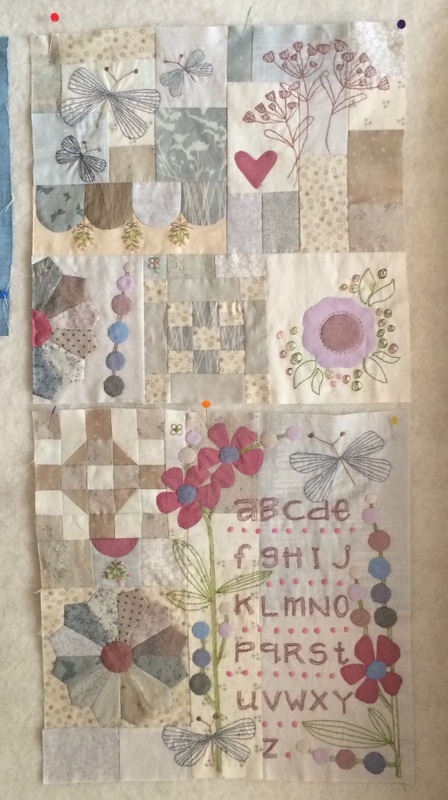 Block two of Mrs Beasley's Sampler Quilt is now finished. I am not sure how they join up as yet as it is a mystery Quilt and I reckon I will have to wait until block four to find out. 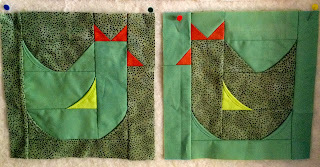 I am pleased with how it is going as each block is 15inches and has such a lot of work in each block, appliqué, stitchery and that's after the block has been pieced. 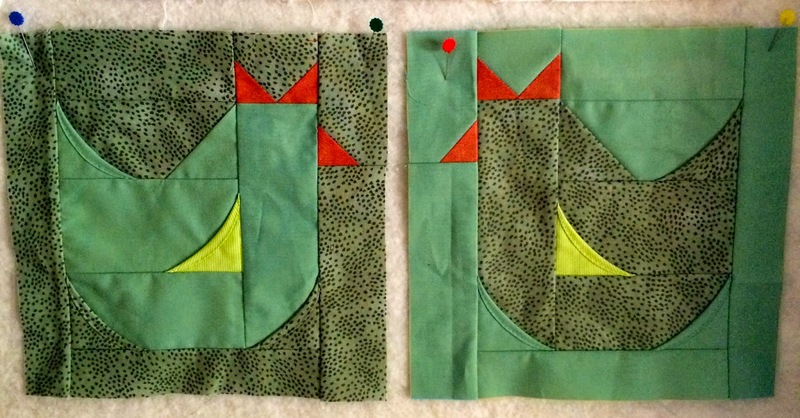 Block three has 39 pieces before the appliqué and stitchery. This pattern is from the Aussie Magazine Vignette and started with issue No 10. It can be bought here in the UK. from Coast and Country Crafts. It is rather expensive but has lots in it including nice recipes. 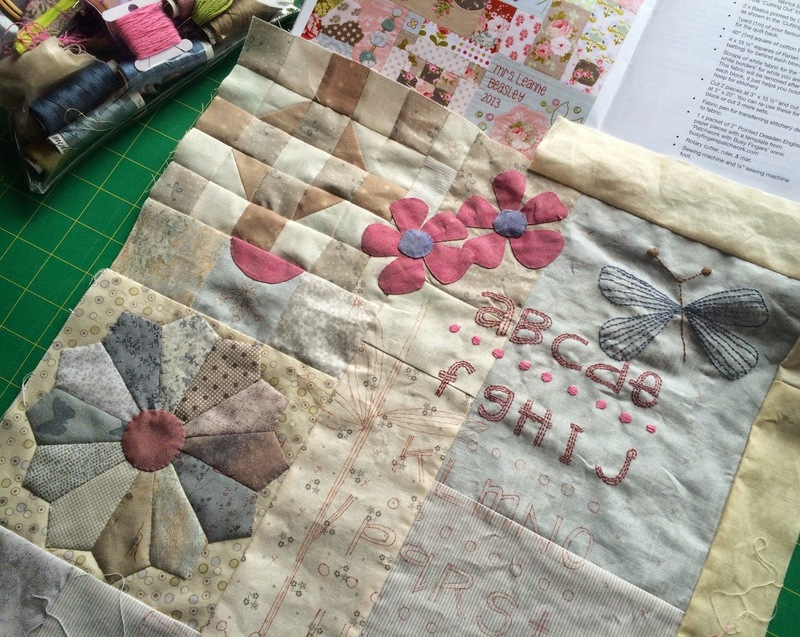 Block 3 looks rather bare, so off to sit quietly and do some needle turn appliqué with a nice cup of tea. It does indeed fly as it's 14 days since I wrote a post and yes, a lot has been going on but I don't seem to have time to write about it. Let alone photograph it. I took a class with the lovely Lynne Edwards. I book in on her class every year at Sew & So's if I can. All I knew was we were doing something called a Curvy Hen. Well this was it, a very cute wall hanging. I did manage to make two Curvy Hens at the class out of some scrap fabric that I had taken with me, which would possibly make a cushion. 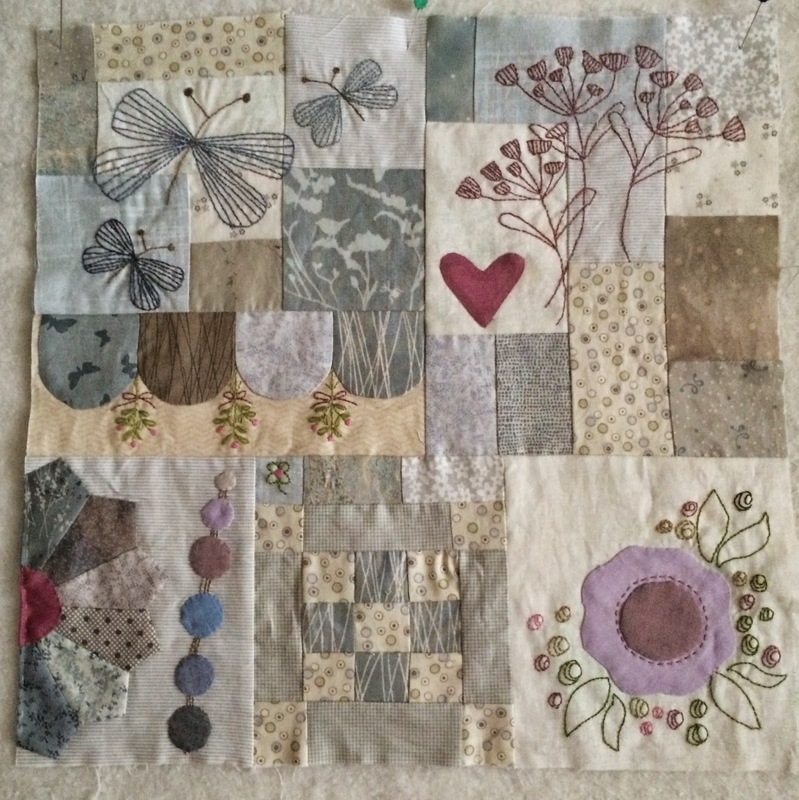 The intention is to choose some more neutral fabric from my stash to make the wall hanging, so watch this space. 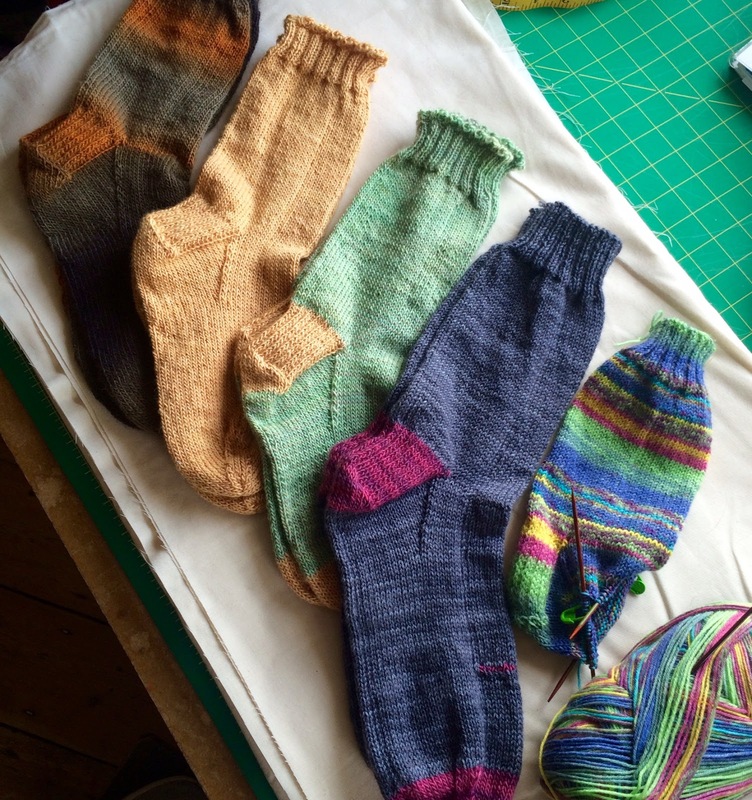 Lynne did say she hopes to make the pattern available for sale. My 2 Curvy Hens done in class. A long time ago, I made a lot of my own clothes and the children's when they were younger. So I thought it was high time I started again. This pattern was bought from Merchant & Mills Drapers on line and this is my first attempt at a work top (Top 64) though I just might dress it up a bit with a pretty scarf or beads and wear it out. My second attempt at top 64 is on the cutting table, fancier fabric this time, not enough done yet to take a photo. In the evenings I have been sitting and knitting or a little embroidery but also nothing yet finished. So it's back to the garden as the sun is out to plant up some of my cosmos seedlings and keep my fingers crossed the slugs and snails don't get this lot. This time it's a Rainy Day.. The weather has changed for the worse so it's a day to light the wood burner and sit and hand sew. 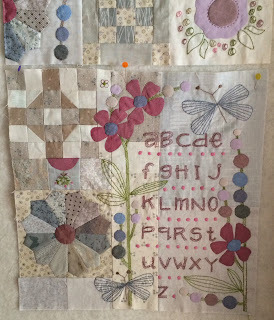 I have been working on a mystery four part quilt, Mrs Beasley's Sampler Quilt by Leanne Beasley. Block one is finished and I have started on Block two. 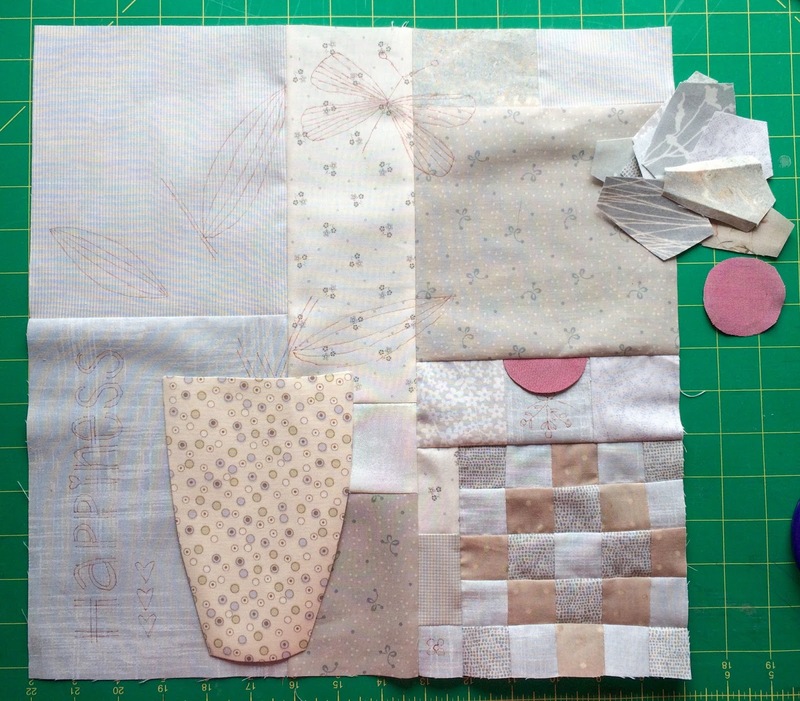 I am well pleased, and using up lots of fabric from my stash as the quilt calls for 21 different fabrics. 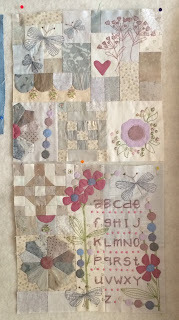 Though some are very small pieces, and some of my treasured Oakshott fabric left over from the Floral Impressions quilt. Block 2 work in progress. 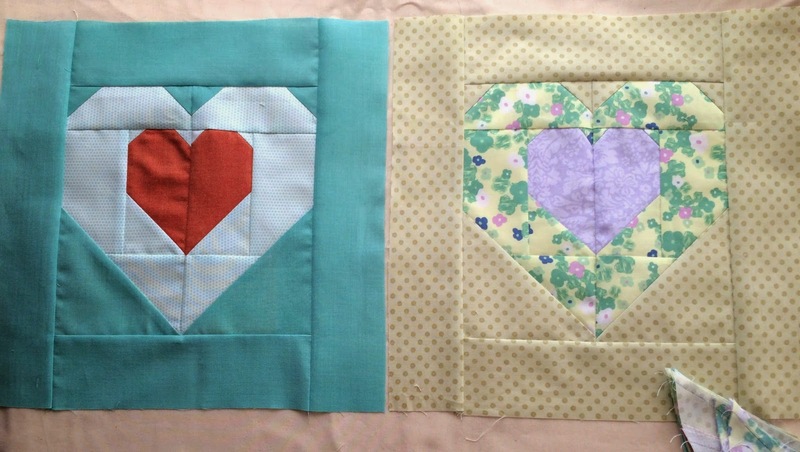 Well there is only a little on this quilt, and it does look nice with the stitchery..
Patshyn Catrin is the mama for May in our Siblings Together group and she has chosen a block that I have never done before, its a Double Heart Block. A tutorial can be found over on her blog. It was fun to make and is rather effective, it looks paper pieced but it's not and very quick to make. 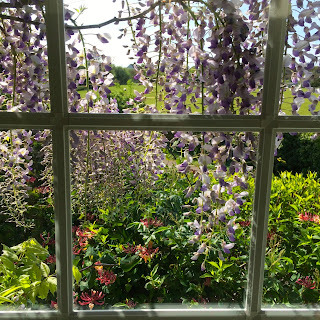 I have not posted a view from my back door for a long while, the daffodils are all finished now and I have quite forgotten what else flowers in that bed. We will have to wait and see. Hopefully Mr M will have put his ladders away too..
View from the back door. 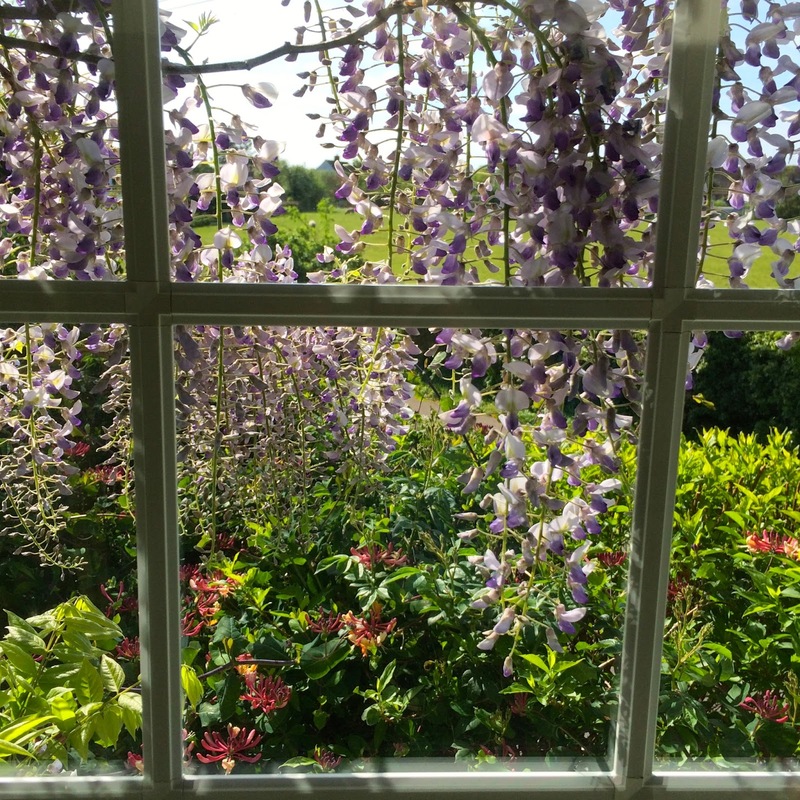 I had thought there were tulips but looking out of another window I now see where the tulips are. Sorry about the reflection from the window, but much to wet to venture out today..
Now to sit and work on block 2 of the mystery Quilt.